we put Robert James Russel's Mesilla to the test. OK, Robert, set up page 69 for us. 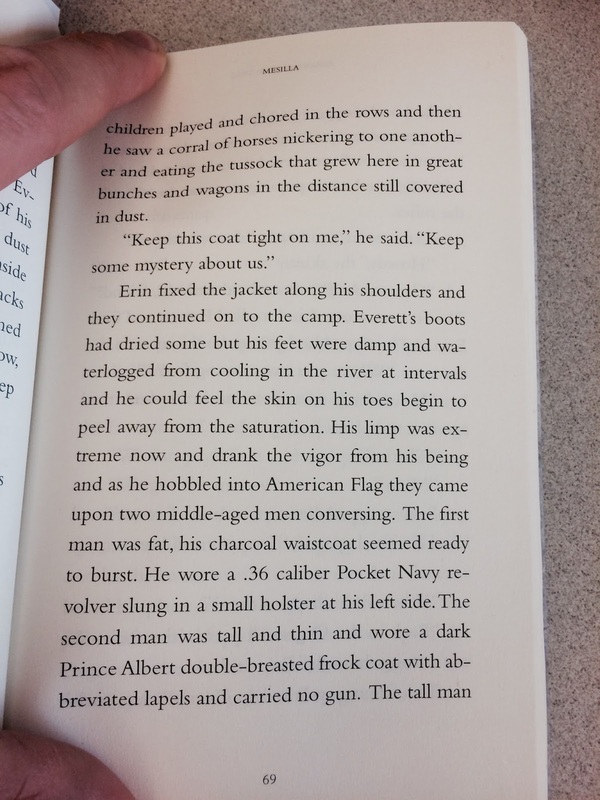 Page 69 finds protagonist Everett Root and his traveling companion Erin Sunderland as they're about to enter a mining camp called American Flag. Everett is worse for wear, really banged up bad, and they’re trying their best to appear normal so as not to draw attention, since they're both on the run with a huge chunk of silver in their possession. Mesilla is the story of a desperate man, Everett Root, being chased through the New Mexico Territory by his one-tine friend who’s out for revenge. Ultimately, Everett is trying to get to the city of Mesilla where he can, in his words, “start over”—be redeemed for his sins and begin again—but he’s injured, being shot at, and trying to survive a painfully cruel landscape. Do you think this page gives our readers an accurate sense of what Mesilla is about? Does it align itself the book’s overall theme? Yes, I think so. A big portion of the book details Everett’s struggles to survive out in nature, him versus it—a theme I’m fascinated by: mankind’s desire to control nature and, quite frankly, remake the world how they want it—but he eventually does find some help, and he does find some respite in the tiny mining camp called American Flag. It does highlight the environment, the world of 1863 New Mexico, and it does, I think, align with this larger theme of control, but it also circles back to a central question posed throughout the novel: Can we start over? This is what Everett is trying to do on this page, and throughout the book; this is a key motivation for Everett and others that gets the plot moving along. Robert James Russell is the author of the novel Mesilla (Dock Street Press) and the chapbook Don't Ask Me to Spell It Out (WhiskeyPaper Press). He is the co-founder and Managing Editor of the literary journal Midwestern Gothic and the founder of the online literary journal CHEAP POP. You can find him online at robertjamesrussell.com or @robhollywood.